Melt butter in 13x9- inch baking pan in oven; remove from oven. Sprinkle cookie crumbs over butter. Stir well; press mixture onto bottom of pan. 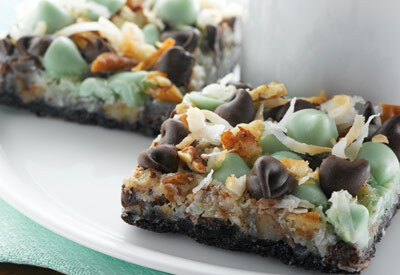 Sprinkle with nuts and coconut. Pour sweetened condensed milk evenly over top. Sprinkle with morsels; press down slightly. Bake for 20 to 25 minutes or until coconut is light golden brown. Cool completely in pan on wire rack. Cut into bars.